As I and others heard earlier this year, Microsoft's next Windows Phone operating system release, codenamed Apollo, is not going to be made available on any current Windows Phones. Not even second-generation Mango phones. Not on the new Lumia models from Nokia. None. Period. Microsoft execs stated this no-upgrade policy officially on June 20 at its Windows Phone Summit in San Francisco. The "official" reason this won't happen is the Apollo release includes too many of the new Apollo features are hardware-related. They'll require multicore Windows Phones, with built-in NFC support and the new Windows Phone core (which is based on Windows, not Windows Embedded Compact) to work properly. Here's the semi-good news: Microsoft will make available an interim update to all existing Windows Phone users that will bring at least one of the Apollo features to their devices. In Windows Phone OS 7.8 -- which is coming some time after Apollo phones start shipping (Microsoft isn't saying when) -- Microsoft will deliver the new Windows Phone 8 user experience to all phone users. This new user experience includes the addition of a third tile size. Now instead of just medium and large, users also will be able to put small tiles on their start screens. And that empty gutter along the right hand side of the Start Screen will be eliminated, allowing the tiles to cover the entire phone surface. The screen shot in this post is a prototype of this new UI that all Windows Phone users, whether running Apollo or Mango, will get. 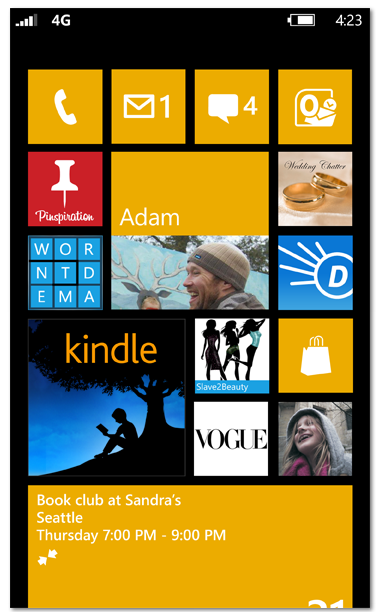 There are now (officially) 100,000 apps in the Windows Phone Marketplace. Chase and PayPal apps are "on the way." Words with Friends and DrawSomething are both new to the store now. Microsoft also is promising Windows Phone 8 will support 50 languages (double the current number) and support 180 countries (triple the current number) with the Marketplace. Even better: Microsoft is committing to make Windows Phone updates available over the air, as of Apollo. And Microsoft is taking steps to stop carriers from failing to deliver updates to users who want them. Starting with Windows Phone 8, every Windows Phone customer has access to every update for 18 months after the device launches, officials said today. Microsoft officials still aren't commenting on some of the other leaked/rumored features, like the replacement for the Zune PC software client; whether/how Mobile Internet Explorer 10 will include proxy support (like Amazon's Silk); or data-metering support. They also are still not talking about the delivery date for the product, though rumors of new Windows Phone 8 devices by Q4 seem like they are still on the money.